If you’re my friend on Facebook you might have seen me announce last week that I am now volunteering for the March of Dimes California Chapter in their Social Media department. I haven’t volunteered for the MoD in an official capacity since 2009, the year Maddie died, and I am honored to have the opportunity to give back to an organization that has done so much for my family. One of the most important things I’ll do as a volunteer is help spread the mission of the March of Dimes, and I’m starting with their annual March for Babies fundraising walk. The March for Babies is the March of Dimes’ biggest fundraiser, and there are walks in cities all over the nation (you can find the one closest to you here). On April 26th we Spohrs will be Marching for Maddie in Los Angeles, the seventh year we’ve marched in her name. By participating, we are helping March of Dimes champion the needs of families and babies in our community and across the nation. The money we raise through March for Babies will support lifesaving research, services, education and advocacy that help babies get a healthy start – babies like Annabel, who made it to 36+ weeks, and James, who made it to 38 weeks, thanks in large part to medical advances championed by the March of Dimes. Our team, March for Maddie, is not only one of the largest family teams in Los Angeles but also one of the most successful fundraising teams in the nation. It’s an honor that all of you help make possible every year. Our team goal is $10,000, but our biggest goal is to get the word out and get lots of walkers. Beyond LA, we’re hoping that everyone who has walked in Maddie’s name in years past will walk again. And to everyone who hasn’t walked yet, we hope this will be the year you join, (or even start) a team. Joining a team means so much to my family. April is hard and emotional, and after the sadness we feel in the days leading up to the seventh, knowing that we will see (either in person or via photos and emails) so many people supporting and remembering Maddie…honestly it’s a light that leads us through. In the last five years, literally thousands of people opened their hearts and wallets and donated to the March of Dimes in honor of our beautiful Madeline. The donations that came in after Maddie passed completely blew my family away, and made sure that millions of people, including lawmakers, know the name Madeline Spohr. As a parent, I am proud and humbled. Thank you. Thank you. If you’re in Los Angeles, we would be honored if you would march with us. 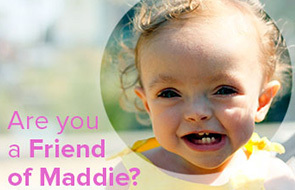 You can sign up HERE to join the original March For Maddie team. If you are elsewhere in the country, please consider joining our team as a marcher in spirit. It doesn’t cost anything but a few moments of your time. Monetary donations can be made directly to the March of Dimes through my link here (thank you SO much). Every little bit helps, even if it’s only a dollar! In 2009, 90% of the donations our team received were for $10 or less – and we were the top family team in the nation! We are also selling Marching For Maddie Shirts again this year. Shirt sales are open to everyone, and all proceeds are going towards Team March for Maddie (we also sell Friends of Maddie shirts). If you want to wear a shirt at your walk this year, be sure to order it ASAP! Most importantly – please help us spread the word and mission of the March for Babies. Share this photo of James ready to march, or the next time you see a sign for the March of Dimes take a moment to explain what the MoD does to the person next to you. Through knowledge comes advocacy and research. Wouldn’t it be amazing to say you helped make prematurity a thing of the past? All registered! Let’s hope I get Dr’s clearance this year! I have my fingers crossed that you can make it, but I am so thankful for your continuing support!! This is wonderful, Heather! Thank you. P.S. That photo is precious!! Heather, I can’t even begin to explain how sad I am that I can’t join you and the family this year. It’s always something I love being able to take part of every year. I will walk in memory of sweet Maddie in austin this year and I can’t wait to make it out there again next year ! Maggie, you are awesome and we are always so thankful that you support us. We’ll miss you but you’re amazing to walk in Austin. Can’t wait to see you next year! I would give anything to be there once again with your family, but it’s looking like I won’t be able to make it happen. I’m going to join your family team, and plan to walk here in Denver. Thank you, Jackie! You are awesome! We are marching in NJ for our 3 miracle preemies: Braedon, Frankie, and Jimmy! I always think of Maddie at the annual March for Babies. I’ll definitely be thinking of her and all of you this year too! Oh, thank you so much, and good luck with your team! You guys are the best. Our team (Team Sophie!) will be marching in the Birmingham, Alabama MfB for the eighth consecutive year. We’re proud to be the longest-running family team in the Birmingham March, and we usually finish in the top three in fundraising dollars! Sophie was born unexpectedly at 32 weeks in 2006, 4#4oz. We knew NOTHING about prematurity, NICUs, bradycardias, etc. But wow did we learn. Sophie’s now a happy, healthy about-to-be eight year old. We feel so fortunate, and we’re thrilled to support the March for Dimes and their critically important work. Heather, thanks to you and Mike for honoring Maddie’s memory in this way. This is a great, great cause. I LOVE Sophie’s shirt! Thank YOU for walking and congrats for all of your team’s success! I found one near me and am making phone calls first thing tomorrow. Your family is amazing. Since reading your blog, I want you to know that I always take the time to point out how important the March of Dimes is to the people around me; when I see a sign up in a doctor’s office or suggesting that my office make a donation after my co-worker sadly lost his son at 27 weeks gestation last year. You’ve made a difference educating at least 100 people I know and I’m only one reader so thank you. I’d hoped to march this year in Maddie’s name somewhere near me in NY but I’m getting married that day. I’ll be sending a donation and thinking of your family and all the babies who benefit from the March of Dimes that day. That picture of James belongs on a March for Babies ad. No, he wasn’t premature but still. My sister had a stillborn baby at 38 weeks in 2007…my nephew Diego. She wanted to do something in his honor and felt the closest cause was the March for Babies so we’ve been walking with our team ever since 2007. This is how I have seen your team every year since I am always there too. I actually approached you and gave you condolences in 2009 but of course I don’t expect you to remember…I’m sure that entire day was a blur. This means I can’t join your team but my heart will be with you. Good luck!